Beautiful, haunting images of animals hang all over the gallery walls. The actual carcasses of animals are laid out, funereally, on their backs. Charming vintage books and odd educational toys fill display cases. The entire Henry Art Gallery has been taken over by the artist Ann Hamilton, who has loaded it with different objects, pictures, texts, and performances related to animals and the sense of touch. And by “touch,” Hamilton means many things: the physical sense, the sensation of being moved emotionally, the experience of making a connection with something. Characteristically, Hamilton has greeted this big space with a blend of exhilarating aesthetic experience and profound emotional and conceptual content. This is why Hamilton is a big deal in the art world. Based in Ohio, Hamilton has visited Seattle for several projects over the years. Recently, Hamilton was announced as the winner of a $1 million commission for a permanent public work on Seattle’s waterfront. While there are certain threads that run through her work over the years — textiles, words, ideas about bodily presence and absence — each project is unique, generated by the particular history and atmosphere of the space. Four and a half years ago, Sylvia Wolf, director of the Henry, invited Hamilton to create something and gave the artist carte blanche. Hamilton could do anything she wanted. She could use the entire museum. Hamilton thought even bigger. She thought about the museum as a place with collections that is part of a university (the University of Washington) with even more collections. She thought about the human activities that take place in these spaces: looking, reading, writing. And while visiting the UW’s Burke Museum, she felt connected to the collection of animals. And so the idea of connection itself became part of the project. 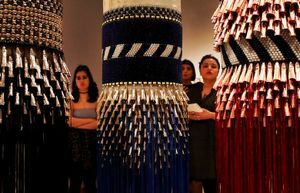 The resulting exhibition offers multiple opportunities to connect and feel. You can push aside cloth panels and peer inside carts to see garments made of skin and fur. There are volunteers reading aloud about falcons and choral students singing melancholic songs about animals. And there are hundreds of ghostly images of animals from the Burke’s collection. Hamilton placed the specimens on a flatbed scanner to create images that focus on the part of the bodies that touched the surface. The other parts of the animals are abstracted, ethereal. Multiple copies are on display — almost floor to ceiling — in four stunning galleries. You can be overwhelmed by the beauty and magnitude of the images of once-living beings. Or you can be specific: Tear off an image and keep it, as a kind of memento mori, as if creating a collection of your own. Quotes about touch are also collectible and are displayed on counters throughout the museum. For me, the least immersive element in the exhibition is the field of windmill-type contraptions. It’s a marvelous installation in its own right, but the other components of the exhibition are more conceptually and experientially linked with one another. These whirligigs felt disconnected from the whole. But disconnectedness is also a theme of the exhibition. We can pull aside cloth curtains but we cannot touch the objects inside their cases. We can listen to volunteers reading or singing, but we may not feel comfortable conversing with them. We are surrounded by the fragments of collections that were accumulated through acts of dislocation. The exhibition is about animals, the commonalities we share with animals, and our uses of animals — their skins, furs, personas, and likenesses. But by heightening our awareness of how we interact with these different images and objects, Hamilton highlights each individual’s experience and the human activities of collecting, reading, writing, and museum-going. We can contemplate what is lost and what is gained as we seek to connect.